Hydrangeas are well-known flowering garden shrubs, beloved for their large, leafy foliage and cotton-candy clusters of white, pink or blue flowers. Several varieties produce only white flowers, while some colored-flower varieties can be changed from pink to blue by adding specific fertilizers or soil amendments. Flower color in these types of hydrangeas is determined by the availability of aluminum in the soil. Though 23 separate species of hydrangea grow around the world, five are usually sold in the United States for home gardens, and of these, the French or bigleaf hydrangea (Hydrangea macrophylla) is very popular. Cold hardy to USDA zone 6, bigleaf hydrangea grows best in moist soils where it will receive morning sun and shade during the hottest parts of the afternoon. To maintain a desired shape and size, prune hydrangeas after they finish flowering. Cutting stems back after Aug. 1 risks eliminating the developing flower buds, as does pruning before flowering commences in the spring. 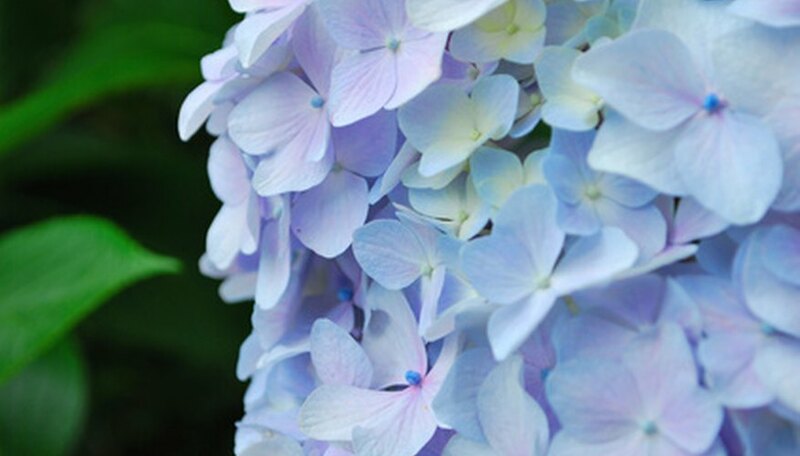 The more than 500 named cultivars of bigleaf hydrangea are divided into two categories, determined by the plant’s flower type. 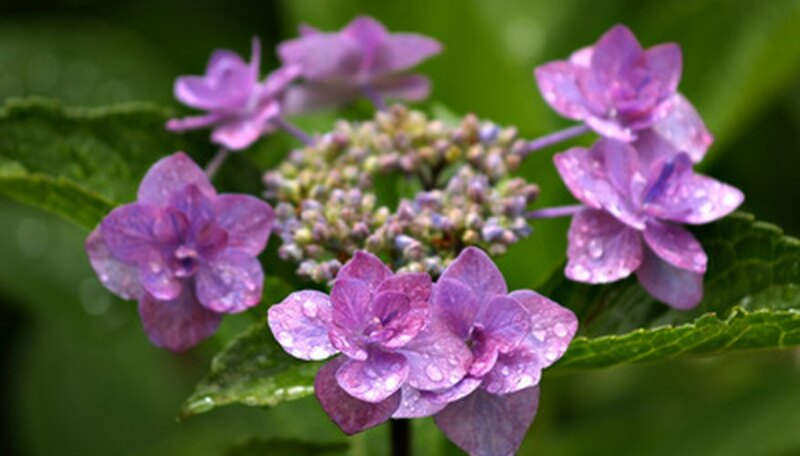 Hortensia-type hydrangeas produce large round clusters of flowers, while lacecap-type shrubs feature flattened flowers with a showy outer ring of petals. 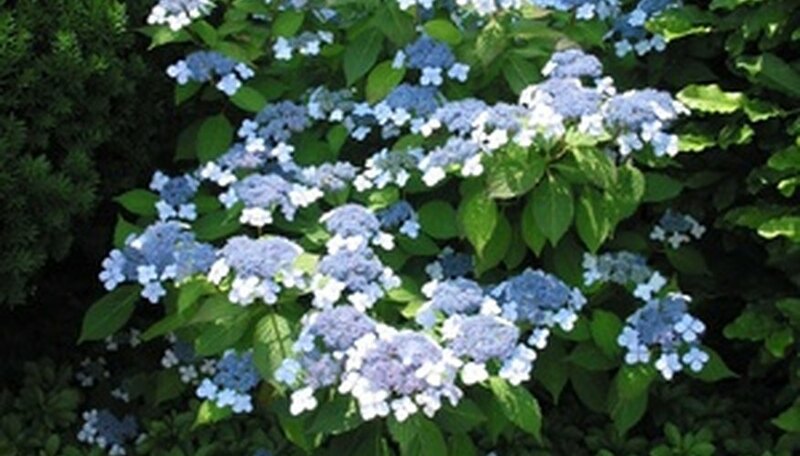 Commonly available hortensia-type shrubs include Nikko Blue, All Summer Beauty, Blue Prince and Compacta; blue-flowered lacecap hydrangeas include Blue Wave and Coerulea. The color of the bigleaf hydrangea’s flower is dependent on the acidity, or pH level, of the soil in which it is growing. Shrubs produce blue flowers when growing in soils with a pH between 5.0 to 5.5, while pink flowers occur at a pH range of 6.5 and 7.0. Soils at a pH between 5.5 and 6.5 will display purple flowers or a mix of pink and blue flowers. White-flowered forms are unaffected by pH and no amount of soil amendments will change the color of the flower. Most municipal water supplies are slightly alkaline (pH above 7.0), so over time many soils will gradually become less acidic. Lowering soil pH occurs more rapidly than raising soil pH, so plan on amending soils to change the pH over several growing seasons or more. Flower color is determined by the availability of aluminum in the soil, which hydrangeas take up more readily when soils are acidic. Adding lime to the soil will raise the soil pH, while adding sulfur lowers pH. Gradually raise pH (encourage pink flowers) by spreading 1 cup of dolomitic lime per 10 square feet around the hydrangea, or lower pH by spreading ½ cup of sulfur per 10 square feet. 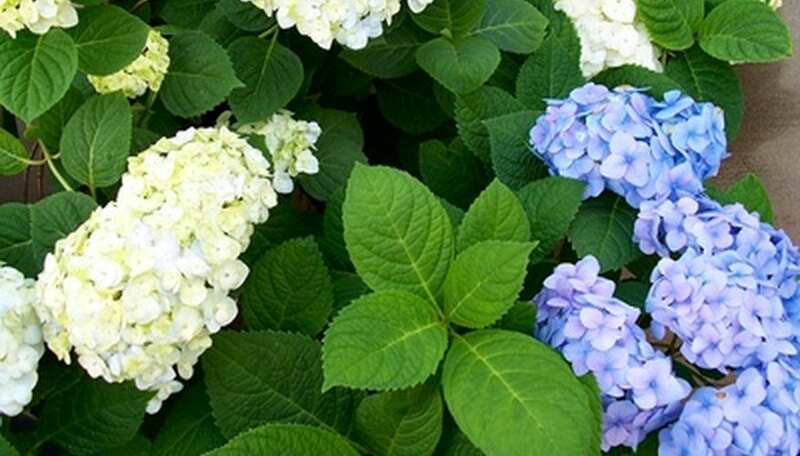 Any all-purpose fertilizer will work as a general plant food for a hydrangea, such as 8-8-8 or 10-10-10, which have balanced ratios of nitrogen, phosphorous and potassium. Using fertilizers low in phosphorous, as indicated by the middle number of the three-number nutrient ratio, will increase availability of aluminum to the plant and encourage production of blue flowers. Other garden amendments can also produce rapid flower-color results. Liquid solutions include watering the shrub with 1 tablespoon of aluminum sulfate dissolved in a gallon of water for blue flowers or watering with 1 tablespoon of hydrated lime in a gallon of water for pink flowers. Use caution when applying solutions of aluminum sulfate, as the mixture can damage roots of other plants, and cause burns to plant foliage and bare human skin.